Do you like summer? Do you like seafood? Do you like eating and drinking outside? If you answered yes to any of the those three questions, Pier A Harbor House needs to be on your radar. 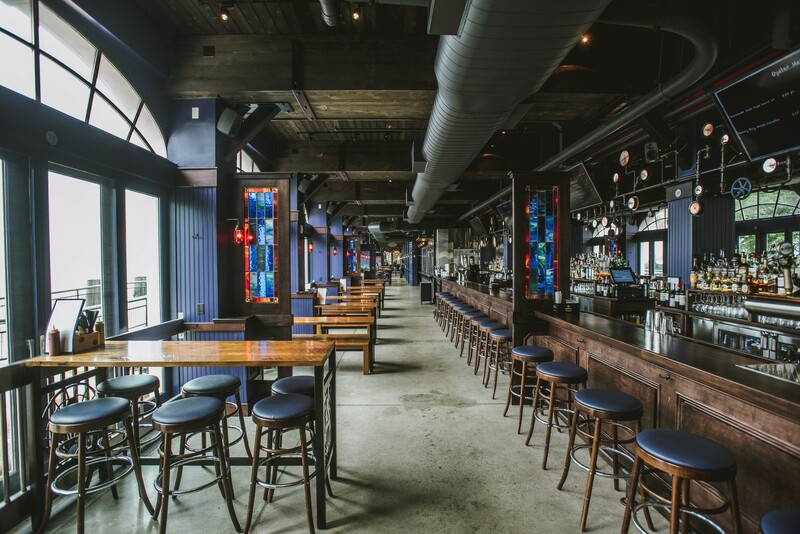 New for summer 2015, Pier A is a monster bar and restaurant located at the southwestern-most tip of the Financial District. This place is absolutely massive. It's literally an entire pier, the kind they sometimes have huge concerts on, converted into a bi-level bar and restaurant with tons of outdoor seating. With a direct line on the Statue of Liberty, it's the single best view a restaurant can offer in NYC. During sunsets, you absolutely can't beat it. Pier A has plenty of big tables both inside and out, which are ideal for large groups, and the menu is full of straightforward, unremarkable seafood that's easy to share. The food is not the reason you're coming here, although we're still thinking about the po boy sliders. The view is the draw. It's nice to be a tourist in your own city sometimes. Lunch is the best time to come here, as it's pleasant and relatively empty. You can chill, take in the sights, and try not to get drilled by the heater that's blasting hot air underneath your table even though it's beautiful outside. From happy hour through dinner on nice days, this place is off the chain. Packed. So much action. At those moments, the scene transforms into some Jersey Shore meets Surf Lodge meets The Boardy Barn (does that place still exist?) scene. After 10pm, people seem to clear out, and you're left with a big empty room that's still got some modern remix of Darude "Sandstorm" with Chris Brown "rapping" turned all the way up. FiDi is not a late night kind of scene, but they do serve a limited late night menu here just in case you find yourself hungry for oysters and calamari at 3AM. If we're being honest, without the overall setting, Pier A is probably gets a 6.0 rating. It's the kind of place you should go once, just to see it. Go with your friends for drinks and some light bites. It's an impressive space, and very different from the kind you're used to hanging out at in New York. Plus, you can call your parents and tell them you went sightseeing. Just leave out the part about the 8 beers you pounded in the process. When restaurants serve oyster shooters, we tend to order them. These shot glasses of oyster and tomato funkiness did not disappoint. Your newest summer accessory? A pretzel the size of your head. Definitely order this. It's super soft and comes with a real tasty honey and beer mustard for dipping purposes. They get a nice daily selection of both east and west coast oysters, and also have a pretty impressive full raw bar, but wave had a couple pretty funky batches of bivalves here. Sticking to the cooked foods is probably a good move. A big pot of sweet Littleneck clams, steamed up in flavorful broth. We enjoyed. Best thing on the menu. We're still thinking about these simple little nuggets of po boy joy. Maybe cooking the oysters is the key at Pier A. Sleeper smoked onions and a lime tinged slaw don't hurt things either. Definitely order these. Solid fish. Solid chips. A safe and reliable option. Instead of a lobster roll, they serve lobster cutters, which are chubbier versions of sliders. We're not mad. Finely chopped, celery and mayo heavy lobster salad squished between toasted potato buns ain't a bad situation by any means. Do it.